Described like this, the guy may seem like just an ordinary Mauritian Desi boy, with an average life and a traced future in some private company. We can imagine him married, a dad, living a laid-back styled respectful life in a cosy home until late elderness takes the toll out of him. But that won’t be the Havish I know, that one who chose the hard way to learn life as a fully fledged, bred and born Mauritian. I remember the first days when I did meet the man. Complicated! Shyness, self-containment and a definite propension to visual, sharp-sighted, silent analysis, were his trademarks. He was more like listening, with that suspicious spy attitude behind dark green Raybans. That was enough to instill distance for less mature members of an emerging brotherhood. Everything indeed to turn a man into an untrustworthy human being, but I had the Eye and so did Peerally. Eye enough to see an unpartial patriot, with values that go way beyond class, cleavage and castes. And that was quite some time back. Since then, he came back from heavy tongue battles, wounded but revived enough to assume his place as a pure activist with relevant, pertinent and sensble things to voice out. I see him now as a leader-to-be who would, as opposed to Jameel Peerally, be the counterpart to basic instincts. The Yin head of a shadow cabinet where decisions are to be implemented in clear transparent fashion. Yes he could… regardless of whatever could have been said about him on some social network. He could indeed become one of these young men who would relentlessly stick to a mission, work for the greater good while living his life to the full. My POV – As I recently put it in an article about Jameel Peerally, Havish Gokool is another young mauritian to watch rising through the next decade. Hopefully not as the same filthy politicians we know now, but as a social activist and federator, who learned the pros and cons of life as a high-profile protester. Yes! He could well be thus. He’s got the guts, the tact and tactics. 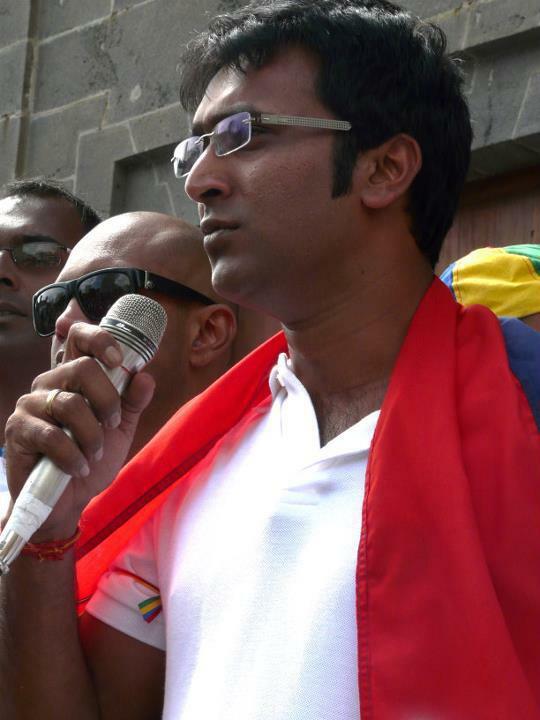 We will see Havish Gokool rise to be revered as a fighter for a united and unified Mauritius. Should I go wrong on this, that would mean that our country has gone hopelessly dry, sterile incapable of yielding intelligent, hi-spirited, generous and brave youngsters. We would then be doomed! But I love to hope that with youthful brainiacs like the Peerallys, Gokool, Casquette, Poussin, Samy and all the others (follow my eyeballs Azir) who, on a daily basis, show indefectible dedication for a nation’s betterment, that our future’s far from fully written. New pages of our own history are to be branded off this generation’s sweat and frustration. This entry was posted in AZIR MORIS, Mauritian Politics, My POV and tagged Alain BERTRAND, Audrey Poussin, Azir Moris, Havish Gokool, jameel peerally, Joel Samy, Mauritian politics, Mauritius, Politics, Sandrine Casquette, WANTED 15000 youngsters to save our future. Bookmark the permalink. ← And when did I start to open my eyes ?